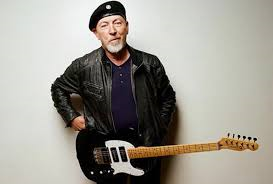 Happy Birthday to the greatest singer/songwriter and the greatest guitarist* in the history of popular music, Richard Thompson O.B.E. (* OK in my opinion, but my website, my rules) born on this day in 1949. Born in Notting Hill, North London music was an important part of Richard’s early life with his father, a Scottish born Scotland Yard detective, being an enthusiastic amateur guitar player with an extensive collection of jazz and Scottish folk music, RT was exposed to a number of styles that he has returned to and has continued to use in his career over the years. His first group, Emil and the Detectives, was formed at school with his friend and future frontman of The Stranglers, Hugh Cornwell. 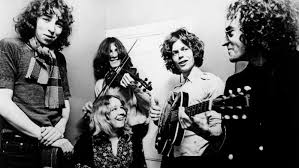 However, it was when RT got together with bassist Ashley Hutchings and guitarist Simon Nicol to form, with Shaun Frater drumming, the band that was to become the driving force in British Folk Rock, Fairport Convention. 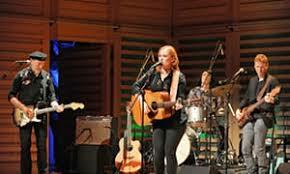 Signed by Joe Boyd to his Witchseason label the band initially covered American folk acts such as Dylan and The Byrds before, after adding more members such as vocalist Sandy Denny and fiddler Dave Swarbrick, the band found both new material from the archives of English folk music and their own original writing abilities to create a ‘new’ sound which was as influential and diverse as some of the other contemporary acts of the late 1960’s. This early period culminated in 1969 with the release of the seminal album, Liege and Lief, that gave full throttle to the whole bands writing and performing abilities but in particular the way that RT’s electric lead guitar was ‘harmonized’ with Dave Swarbrick’s fiddle playing which, with the rest of the bands playing support, enhanced and complimented the beautiful singing of Sandy Denny. At this time tragedy had already struck the band as drummer Martin Lamble and RT’s then girlfriend, Jeannie Franklyn, had lost their lives in a crash on the M1 motorway, one in which Richard had also been badly hurt. The band very nearly disbanded but the decision was made to carry on, culminating the afore mentioned Liege and Lief. The standard both of playing and writing, and in particular from the still 20 year old Thompson is remarkable from songs such as Crazy Man Michael and Meet on the Ledge, songs that to this day still carry the power and emotions of 50 years previously. 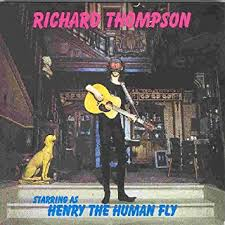 Richard only recorded one more album, Full House, with Fairport Convention, before he followed Ashley Hutchings and Sandy Denny to leave and work on projects with, in 1972, his first solo album, Henry the Human Fly. 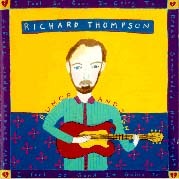 Following this album, Richard has over the years written and recorded, a number of critically acclaimed albums; firstly with his first wife Linda, and latterly solo with a succession of great albums including in 1993 Mirror Blue which was preceded by, in 1991, what I believe to be the best album ever recorded, Rumor and Sigh. This album includes on it what I also believe to be the single best song ever written, Vincent Black Lightning 1952. Vincent is a song that shows off both Richard’s amazing ability as a guitarist but also his finely tuned ear for both a melody and a lyric; it is a song that tells a story in a beautifully descriptive fashion in which you feel both the love that James and Red Molly have for each other but also both pain and loss of that love. This is perhaps the true talent of Richard, the way he can put into words and music some of the most difficult and emotive subjects; from the jealousy of a lover in Cold Kisses to the underbelly of life in Down Where The Drunkards Roll. However, whilst Richard is happy to wallow musically in misery and is the master of the murder ballad, he also writes songs with a wicked sense of humour, a scathing wit and a withering turn with a put down. Songs like I Feel So Good or I Read About Love cannot help but bring a sardonic smile to the listener. 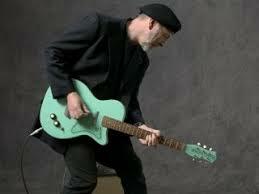 Richard Thompson has, over 50 years in the music business, been responsible for some of the greatest music you could possibly have the pleasure of listening too. And all the while whilst staying under the radar; RT is probably the best musician many people have never heard of. 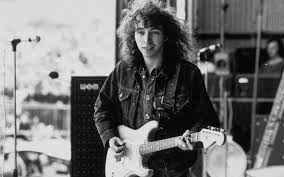 Both on stage and off Richard can come over as a shy and almost reticent performer that only truly gets released when playing his guitar or singing his songs. However, he is also so committed to both his craft and in helping others realise their potential; his regular frets and refrains courses he runs and tutors on in the USA are well respected and over subscribed events. And not only his music, the Thompson musical legacy is in great hands as the Thompson family are a multi-talented bunch with RT’s kids, Teddy and Kami in particular, finding success and their own voices in the music industry. I have had the pleasure of meeting Richard on a number of occasions now, having played cricket with him, and indeed captaining the Fairport Convention team last summer, and have always found him to be a most genuine, kind, passionate and lovely guy. Happy to talk to and make time for fans and friends Richard is a true gent, artist and legend. Many happy returns RT!